Pure Digital Technologies Inc was kind enough to send us a review unit of The Flip Mino video camcorder. To prepare for this review, we put the pocket-sized Flip Mino through its’ paces over the last few months. Pure Digital has seriously revolutionized the home video camcorder market by creating simple to use, compact digital camcorders that anyone can utilize. Over 1 million Flip camcorders have been sold so far and the number grows monthly. Before we dig in, let’s see what Pure Digital is claiming that the Mino is capable of. Here are the main Flip Mino features as described by the manufacturer. Next, we take a look at what’s inside the box. The Flip Mino comes delivered in a nice looking box that includes the Mino itself, a lanyard, a carrying bag that doubles as a lens cloth, a quick start guide, a warranty insert and a set of standard yellow/red/white audio/video cables. Notice that we were also able to get our own custom “WesleyTech.com” image imprinted on the front of the Flip Mino. This is a free feature when you order at TheFlip.com. The entire process is quite painless, you simply upload a photo or an image from your PC to TheFlip website, align the image over an outline of the Flip Mino and then save your creation. Below are two different photos of the Flip Mino itself, with it’s signature flip out USB plug protruding from the top right of the device. For the videos embedded in this review, we used video recorded at two different locations. The first was indoors, at the Speed Street indoor go kart race track in Glendale, AZ. The second was outdoors, at the North Mountain preserve hiking area in Phoenix. These videos can help you get a glimpse into the audio and video quality of the Flip Mino camcorder. We uploaded the first video to Vimeo. 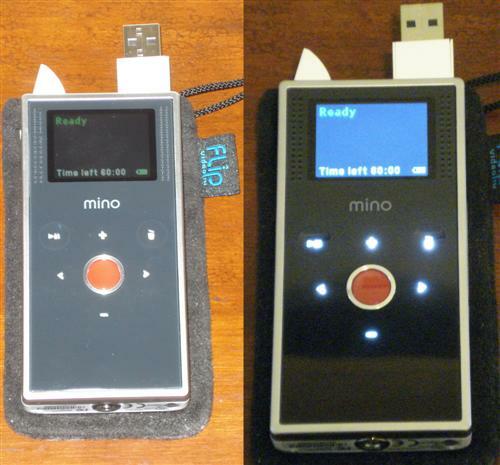 The voice-over segment at the beginning of the video was not recorded on the Flip Mino, all other conversations were. The second video was sent to YouTube. The video on Vimeo looks much better as it is a less compressed form of the original video file and has a better resolution. Drawing from our experience with the Flip Mino over the last few months, we would like to wrap this up with our list of positives, negatives and some final thoughts. All in all, we simply love the portability, ease of use and quality of the Flip Mino camcorders. They are compact, easy to use and can be added as a supplement to an existing arsenal of camcorders or used as a primary video camera for the casual user. 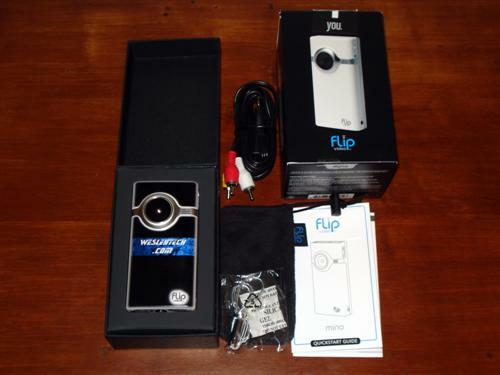 We would not hesitate recommending a Flip video camera to anyone, especially to those who are looking for a camcorder to use for creating videos for the web. The Flip Mino can be purchased for $159 at Amazon or straight from the manufacturer at TheFlip.com. Videos were edited using Pinnacle Studio 12 software on Windows XP.